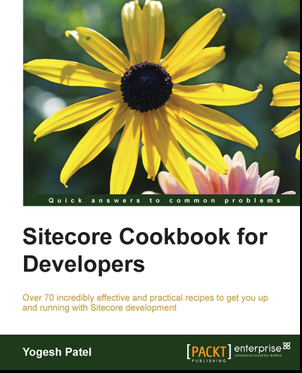 - Sitecore application slows down due to frequent publication or frequent cache clearing. - Publishing being queued for users due to slow & repetitive publishing. - It is becoming difficult to monitor your publishing and related consequences. There are FIVE thumb rules to get optimized publishing, which solves all above problems. Below is an approach described theoretically. I'll be posting its practical implementation soon!! Smart Publish and Republish both have their own pros & cons. Can't we produce an intelligent publish mechanism which can join all pros of both approaches and without getting their cons? This approach I named Intelligent Publish. Smart Publish checks Publish Status of individual at time of publish, which play a bigger role in slowing down publishing. In it, only modified items will get published. In Intelligent Publish, we will list down which items to be published and then send these items to publishing . So, this will save much time at time of publish. Also, these items will be sent as Republish. Intelligent Publish shares all pros of both approach without sharing cons. But yes, it is not easy to implement this approach. Below table shows difference between them. 5. Publish items Publishes all items Publish only modified items checked in Step - 4. Publishes only filtered items in Step - 2. It goes worst when user needs to select items and publish them one-by-one. Don't you think it increases client clicks and wastes time and frequency of publishing? Smart publish the site is also not a solution here. To prevent this situations, we can allow users to use Publish Basket. Users can add n number of items in basket and send them to publish in one go. We might need to use an external DB to store basket items and send to publish. 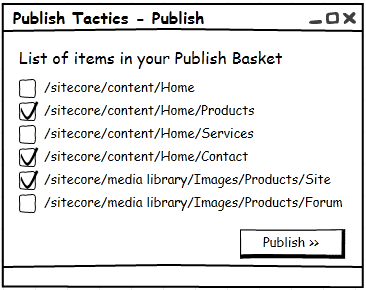 See below snap, shows mockup for Publish Basket. We can allow referenced items to get publish along with the selected publishable item. The references can be all referenced media as well as all items which are selected in fields like Multilist, subtree, etc. This will reduce frequency of publishing, that will reduce frequency of clearing HTML cache. Suppose, your client has to do publish after few hours for many items. Is it good that your client will remember the exact timings of publishing, say publishing at mid-night? 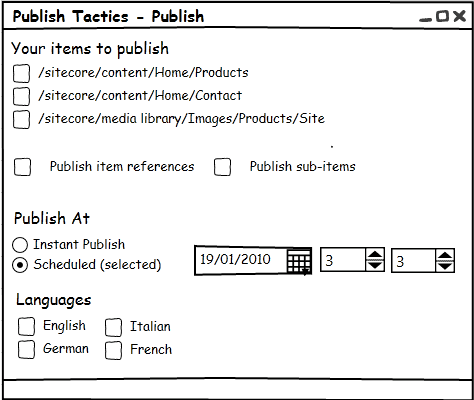 Now you feel, how important role the Scheduled Publish can play with Publish Basket functionality. We can allow user to do publish at specific date and specific time. See below snap, shows mockup for scheduling items. Using separate publish instance can give many benefits if we are getting slowness on CM server at time of publish. In this case, all load of heavy publish will be taken by PI and CM can work without worrying that much about Publishing going on. Below snap shows how Publishing will work with a separate Publish Instance. 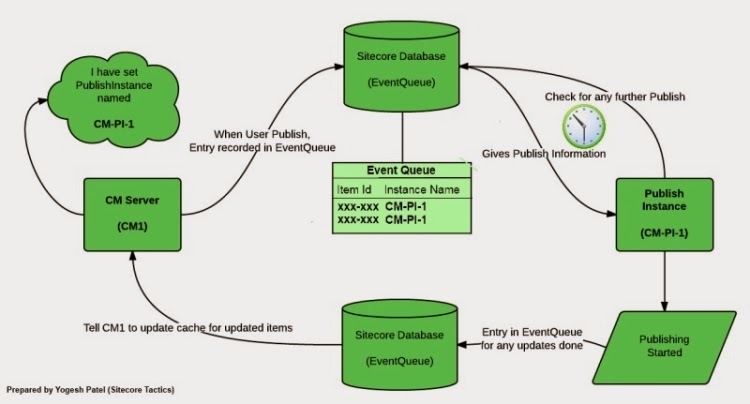 Read How to setup Sitecore Publish Instance. Are your clients complain about queue stuck up while publishing? You may have faced issues like many users have set publishing so important publishing gets queued for a long period of time. To prevent this kind of situation, we can share load of publishing by having multiple publish instances. We have successfully implemented multiple PI and working great without any problems since July, 2012. Read more about Multiple Publish Instances or Parallel Publish in Sitecore. Yeah.. I was planning to describe the whole architecture what we have implemented and working great from last 3+ years, but it's difficult to explain on blog so I haven't finished yet with it. Still, I can explain you how we have customized publishing and different ways of optimizing (might not be covered here). I can be reachable on gmail chat/call though - contact@patelyogesh.in.